I have an azalea which is around 40 years old. Half the shrub has died off and the whole thing is covered in some sort of pale grey/green rough looking fungus on the twigs of the branches. There are no flowers this year and it looks very bad. I am also bothered that it could pass to the other azaleas in my garden. What you are seeing on the shrub is lichen. It is not the cause of the problem, but rather a symptom. They tend to attach to shrubs/trees that are sickly and unhealthy. 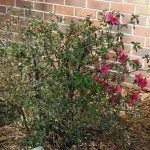 This article will give you more information: https://www.gardeningknowhow.com/ornamental/fungus-lichen/treatment-tree-lichen.htm In regards to what may be wrong with the azalea, I would take a look at the roots. 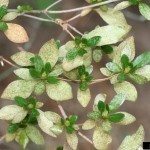 You may have some root rot or the shrub may simply be dying naturally. It may also be a fungus attacking the azalea, so you should go ahead and treat it with a fungicide, which will actually also get rid of the lichen.